An hour (6:30pm-7:30pm) event at The Chevron, near IMM. Thought it was Chevron House initially. Checked Google Map and it keeps showing me Raffles Place area. 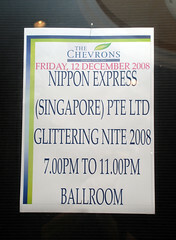 Called the event organiser, and he told me that the latter is Chevron House. 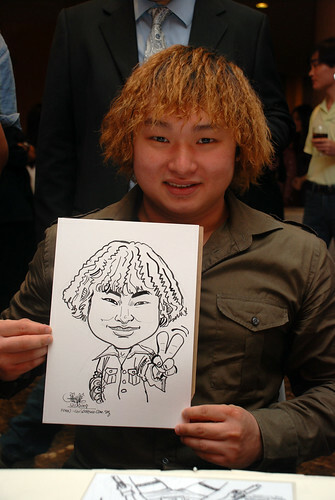 Usually, 1-2 weeks before Christmas are the hot dates (especially Fri and Saturday evening) for pre-event entertainers like magicians, balloon sculptors, airbrush tattoo artists and caricaturists. 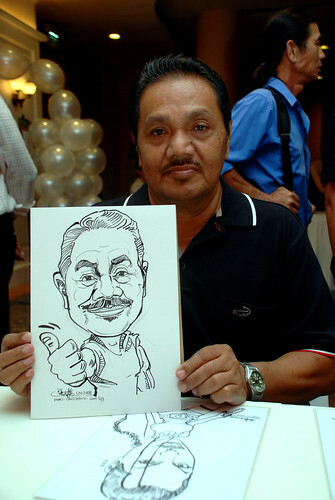 This event organiser contacted me about 2 months before the event, and requested for 2 caricaturists, but the better caricaturists I know, were all booked. 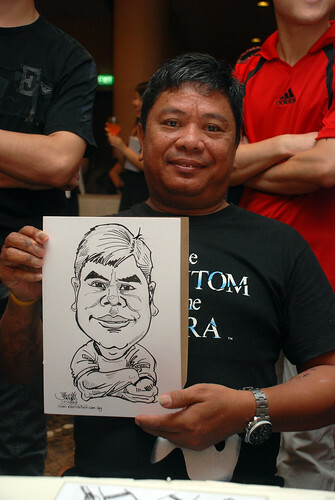 Told him I can't get another caricaturist for him, but he told me it was fine. 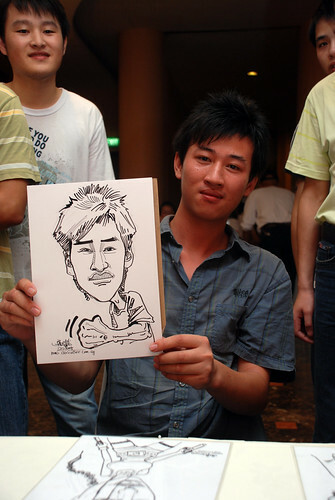 I received many calls from different event organisers on and off, all asking me whether I am available, or whether I have caricaturists on hand for them. 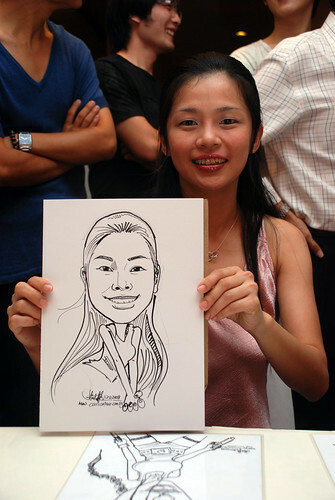 Pre-event entertainers are not many in Singapore, especially when we have so many corporates holding their year end parties, dinner and dance, and Christmas parties at the same time (and the pre-event entertainment usually crash at the same time - 6pm - 7pm and 6:30pm - 7:30pm.). The supply is definitely will not be able to meet up with the demand. 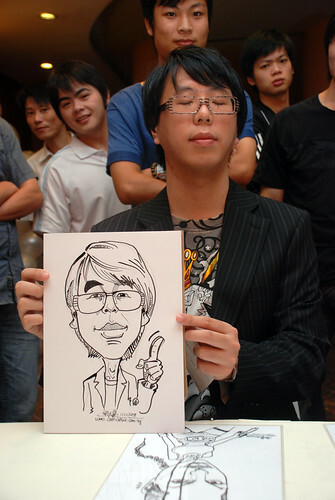 Snapping a photo of it, is always faster than me jotting them down on paper. What a pity. He closed his eyes at time of snap, and I didn't really check through my shots. 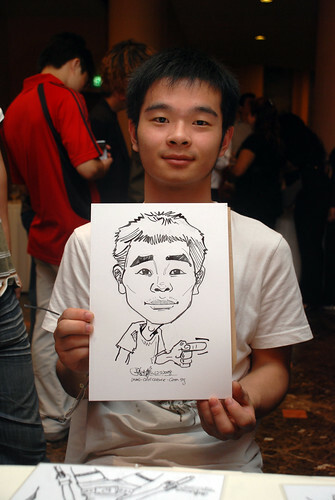 As long as the lighting is bright enough, as shown on the LCD, I will proceed with my drawings. 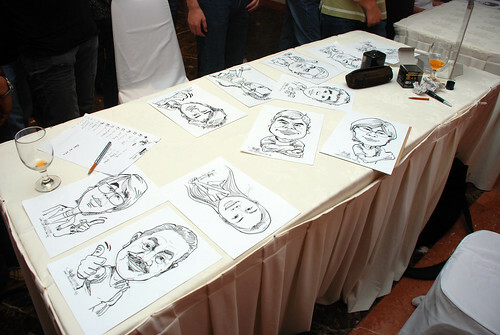 These 2 caricatures were the better few. All waiting for the ink on the paper, to be fully dried up. 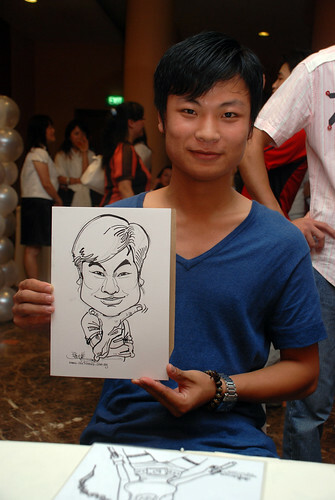 The event organiser found his own caricaturist - Desmond. Met him a few times in events. He asked me to sub-out some events and drawings to him. I asked for samples from him, but have yet to receive it from him. 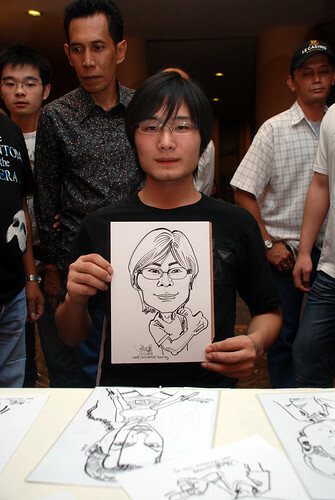 Today, he did one caricature based on imagination, before the event started, to show me. Told him that I need to take a snapshot of his samples, but he said no. Anyway, that's the end of the story.